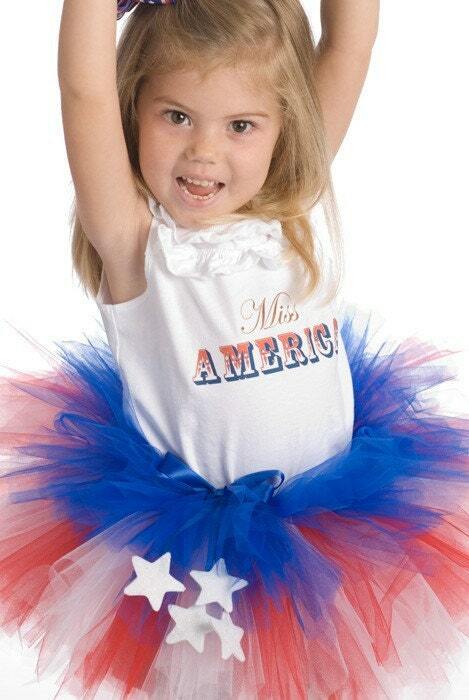 Is this not the cutest tutu?! It makes me wish that my daughter would wear one so that I had a good excuse to make it! Anyway, I did a quick google search and found several places that I could buy the instructions, but I'm cheap and decided that I could figure it out on my own. Sure enough, I did. And can I just say that this is SUPER EASY!!! 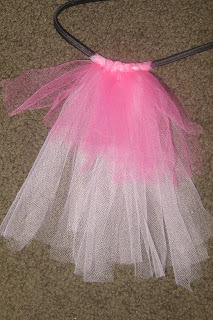 Don't be fooled by the cuteness of it, it isn't any harder than your standard tie-the-tulle-onto-elastic-tutu. Ready to learn how to make one yourself? 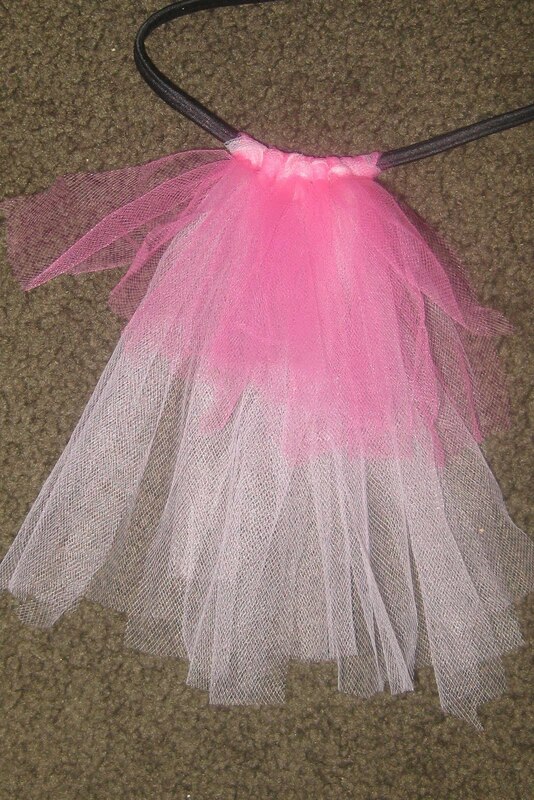 Start by cutting the tulle for the bottom layer into strips 6 inches wide (the width is entirely up to you, anywhere from 2 to 6 inches wide will work just fine) by twice as long as you want the finished length to be (so for a 10 inch long tutu cut 20 inch long strips). 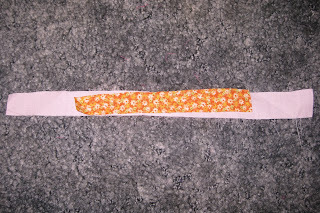 Now for the top layer, cut the strips equally as wide and about half as long. 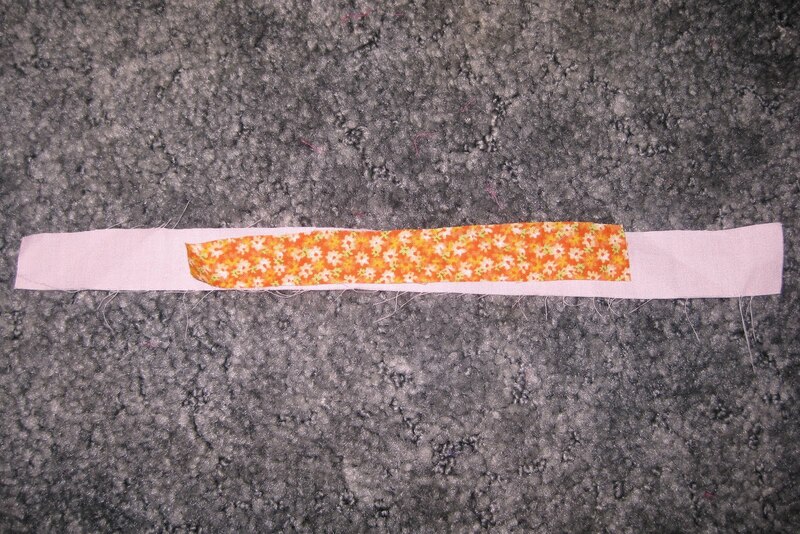 Then you are going to want to stack one top layer strip onto one bottom layer strip so that the middles line up, like so. I realize that this isn't tulle, but cotton photographs better and quite frankly when I started this I couldn't find my stash of tulle. 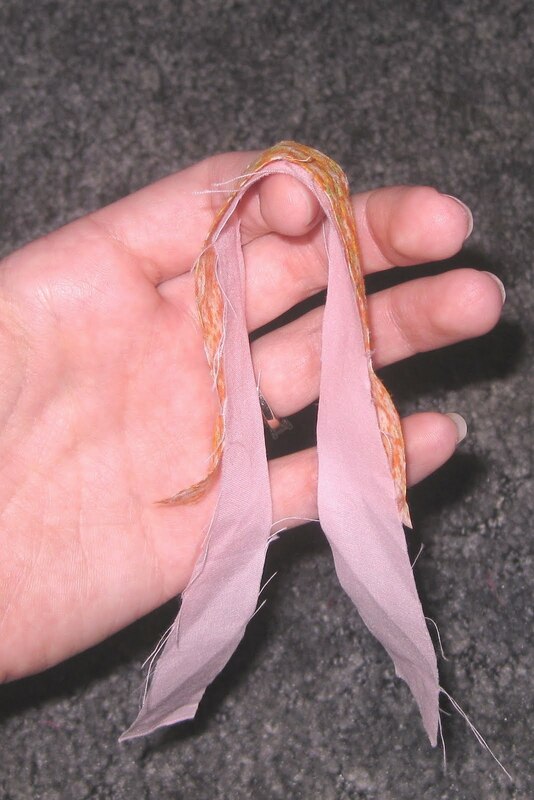 Now that you've got your tulle strips stacked together we are ready to tie them onto the elastic (either use plain elastic measured to the size needed and stitched into a circle or depending on what size you need you might be able to get away with a narrow elastic headband like this). 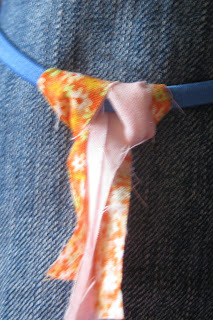 then slip the strips under your elastic (which I like to put around my thigh while doing this). I don't have a picture for this next part but you are going to pull the bottom "tails" of tulle through the circle where your finger is. It should look similar to this (sorry for the blurry pic). Now pull it tight! Just keep adding your strips of tulle until you just can't fit any more onto the elastic, or until you are satisfied with the fullness of the tutu. If needed you can pull the top layer up to more fully separate it from the bottom (I found my tulle! Light pink is still light pink, what was orange in the pics previously is now hot pink) and trim the ends to make the even if needed. You should now have two very distinct layers! I didn't finish because I didn't have enough tulle and like I said before, my daughter won't wear it anyway, but this should give you an idea of the finished look. To get the red and white stripes on the bottom layer, I would do three red then three white and just go back and forth with the blue on top every time. I hope that made sense and if any of you make a double layered tutu I'd love to see it! Marvelous. Those are so cute and really very beautiful they dress with superb style and colour. I really wonder with their work, For me it is very impressive. I do this same work for my sister 's daughter. But I was done it with the red, blue and yellow combinations. She receive that with the sweet smile and I will share that moment in my blog soon. Black, white and pink colour I used in my fabric work, It is too long and also added two rings, First I stitched demo in news paper and magazine cuttings, then I tried to fabric. Thank you so much for this FREE tutorial!! It was very helpful, can't wait to try this! Thank you- have made single layer, can't wait to try this! 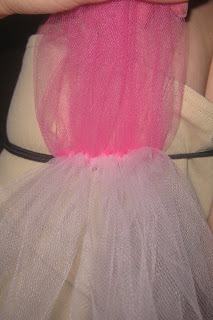 Loved this, my tutu turned out perfect. Thank you for making it FREE. You are awesome...this is exactly what I was looking for. Thank you, thank you, thank you! Seriously have been looking for something like this for FOREVER!!! 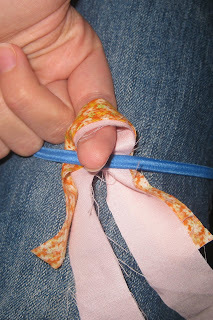 Have only found tutorials for sewing OR for tieing the tutu pieces into square knots, which didn't turn out well. Thank you!!! Thank you Ashley! I appreciate you taking the time to share your tuturial! This seems very easy and I can't wait to make tutus this way!! You are so sweet for taking the time to explain this to everyone! Thank you so much, I've been looking on you tube with no success. You were the first to pop up on a google search! I love that you are sharing free information, it makes crafting so much fun when we all pull together! I making this into a dress for my daughters 1st birthday party. Thanks again! Hey everybody, I'll be over at Gluesticks today! You've got to check out Brandy's blog...it is AWESOME! Bellin Run as Wonderwoman. 50 Running Songs to get me pumped!